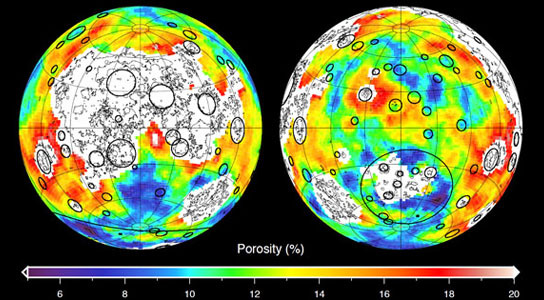 This image depicting the porosity of the lunar highland crust was derived using bulk density data from NASA’s GRAIL mission and independent grain density measurements from NASA’s Apollo moon mission samples as well as orbital remote-sensing data. Red corresponds to higher than average porosities and blue corresponds to lower than average porosities. White denotes regions that contain mare basalts (thin lines) and that were not analyzed. New data from NASA’s Ebb and Flow probes was used to generate a high resolution gravity field map of the moon, showing that the moon’s gravity field is unlike that of any terrestrial planet in our solar system and revealing an abundance of features never before seen in detail. Pasadena, California — Twin NASA probes orbiting Earth’s moon have generated the highest resolution gravity field map of any celestial body. These are the first scientific results from the prime phase of the mission, and they are published in three papers in the journal Science (“The Crust of the Moon as Seen by GRAIL”, “Gravity Field of the Moon from the Gravity Recovery and Interior Laboratory (GRAIL) Mission”, “Ancient Igneous Intrusions and Early Expansion of the Moon Revealed by GRAIL Gravity Gradiometry”). According to Zuber, the moon’s gravity field preserves the record of impact bombardment that characterized all terrestrial planetary bodies and reveals evidence for fracturing of the interior extending to the deep crust and possibly the mantle. This impact record is preserved, and now precisely measured, on the moon. The probes revealed the bulk density of the moon’s highland crust is substantially lower than generally assumed. This low-bulk crustal density agrees well with data obtained during the final Apollo lunar missions in the early 1970s, indicating that local samples returned by astronauts are indicative of global processes. The map was created by the spacecraft transmitting radio signals to define precisely the distance between them as they orbit the moon in formation. As they fly over areas of greater and lesser gravity caused by visible features, such as mountains and craters, and masses hidden beneath the lunar surface, the distance between the two spacecraft will change slightly. 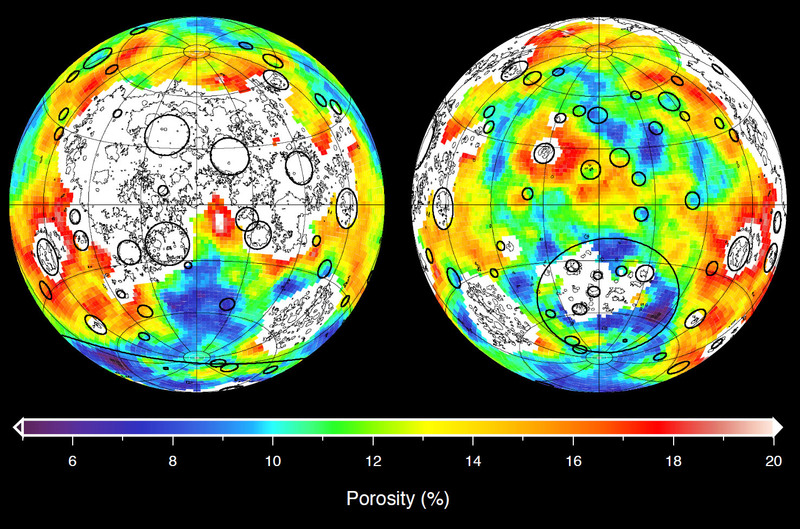 This map shows the gravity field of the moon as measured by NASA’s GRAIL mission. The viewing perspective, known as a Mercator projection, shows the far side of the moon in the center and the nearside (as viewed from Earth) at either side. While results from the primary science mission are just beginning to be released, the collection of gravity science by the lunar twins continues. GRAIL’s extended mission science phase began Aug. 30 and will conclude Dec. 17. As the end of mission nears, the spacecraft will operate at lower orbital altitudes above the moon. When launched in September 2011, the probes were named GRAIL A and B. They were renamed Ebb and Flow in January by elementary students in Bozeman, Mont., in a nationwide contest. Ebb and Flow were placed in a near-polar, near-circular orbit at an altitude of approximately 34 miles (55 kilometers) on Dec. 31, 2011, and Jan. 1, 2012, respectively. NASA’s Jet Propulsion Laboratory in Pasadena, Calif., manages the mission for NASA’s Science Mission Directorate in Washington. GRAIL is part of the Discovery Program managed at NASA’s Marshall Space Flight Center in Huntsville, Ala. Lockheed Martin Space Systems of Denver built the spacecraft. 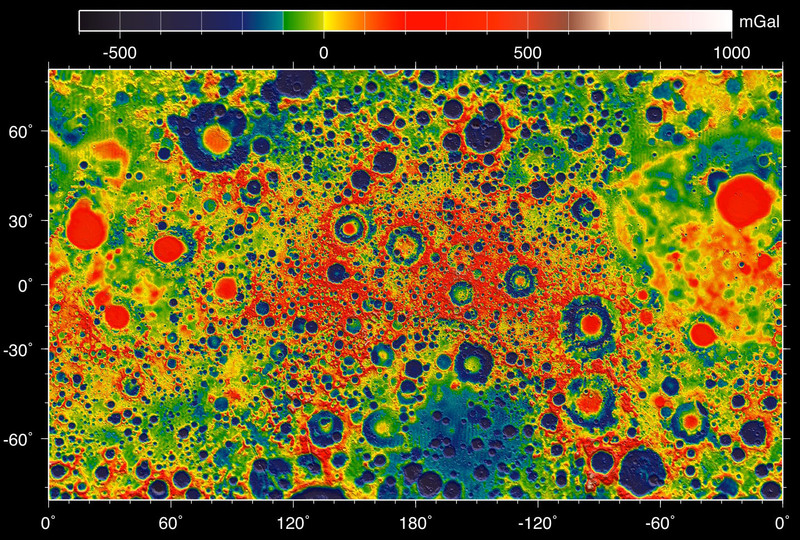 Be the first to comment on "GRAIL Generates High Resolution Gravity Field Map of the Moon"